How do you get your brand noticed during the busy holiday season? Simply follow the recommended practices in this blog post and beat the holiday retail rush with push notifications. As the holidays approach, people are constantly on the go. Whether spending time with family, getting an early start on shopping or preparing delicious meals to be enjoyed by family and friends. Amidst all this hustle and bustle marketers are fighting for every bit of their customers’ attention. There are many channels to help you reach your customers, including email, web, social and mobile. However, to ensure your messages get through, your first choice needs to be mobile. Why Use Push Notifications During The Holidays? When a user downloads your app to their smartphone, it creates a special relationship with your brand. The app goes wherever the user goes. Today’s customers can research a product from anywhere via their mobile devices. They read your product reviews, and use social media to request feedback while physically in a store. In addition, they compare store prices. Unfortunately, mobile customers are easily distracted. Receiving a phone call or a Whatsapp message can take your customer out of the purchase process, resulting in lost revenue. When they are on the go it is even harder to keep them engaged as they could also be distracted by offline experiences. Push notifications are great for engaging customers on the go. They are best used to connect the customer to offline and online experiences by providing information relevant to the customer’s current location and activity. Think of push notifications as the bridge between the customer and your brand. How to Increase Engagement Using Push Notifications During Holidays Do you want your push notifications to stand out from your competition and truly engage your customers? In the following sections I review the best practices before, during and after the holiday period. Tips for Pre-Holiday Mobile Campaigns: 1. Plan your campaign with intent: Ensure targets are set and goals are laid out. A clear strategy will bring better results. 2. Reflect on last year: What are the lessons learnt from last year’s season? What went well and could be replicated and what should be improved? 3. Prepare content and visuals for your campaigns: Don’t wait to the last minute to create your messages. Prepare the copy and test it. Ask your designers to come up with stunning visuals to compliment your content and plan when to use each one. This is the time for marketers to get creative. Plan push notifications which incorporate jingles, lyrics and catchy holiday phrases. 4. Integrate cross-channel marketing: Integrate a cross-channel marketing messaging system to ensure a multi-channel shopping experience. Integrate your holiday marketing campaign on other platforms as well. Promoting your app through email, social media and your website will increase your app’s exposure. Download our guide that presents the key elements that must be considered when developing a strategy that is delivered via both email and mobile push messaging. In outgoing campaigns prior to the holidays, include a call-to-action to download your app and explain customers why they should download your app. 5. Update your app to increase engagement: This is a great chance to update the app user interface to include a holiday theme or add functions to make shopping easier. It is important to give your users visual, auditory and textual cues to show that this time of year is unique. For instance, a store could create an updated version of its app exclusively for Christmas. It could provide sections for top gift ideas, sales, recipes and ingredients. It could then send notifications to customers with individualized information based on behavior, keeping it relevant for each customer. Music as well as Christmas imagery could be added. Just like that, your app could become a unique and fun holiday shopping experience. 6. Make sure your payment and transaction systems are easy to use: Choose a mobile-friendly payment system to stay competitive and not lose customers as a result. 7. Anticipate problems: Anticipated problems should be dealt within the planning stages. To launch an app update for the holidays, make sure to plan ahead and submit it with enough time for it to be approved. Plan early to ensure your servers have enough capacity to handle traffic spikes. 1. Provide locally relevant messages: Send information and offers specific to customers’ localities, reflecting on data such as weather and traffic conditions. Include offers related to local holidays and events and content that will complement an activity customers might be engaging in. Help the customers to get to your store – consider sending a push notification and sharing your location via Google Maps or Maps for iPhones and iPads. 2. Offer mobile and in-store engagement: Use multi-channel strategies to target your customers on their mobiles and in your store. Change your in-store smart TV display according to the type of people you have in the store. Send offers relevant to their current interest as well as for additional products to complement the purchase. Allow them to create lists which they can access from within your store and then steer them towards their chosen product. Maybe you want to offer in-store pickup? 3. Initiate mobile-only deals: Give your customers an incentive to make a purchase on their mobile. The holidays are a great time to offer loyalty rewards to those responding via mobile. 4. Send a product sneak peek: Excite your customers with sneak peeks of various products. Take advantage of opportunities for engaging messages wherever possible. 5. Send highly interactive messages: Here is your chance to bring out those perfectly designed holiday themed messages complete with all the sleighs, bells and whistles. Be sure to encourage customers to take immediate action. A push notification with a limited time incentive that includes a clear call-to-action will increase your conversion rate. Keep the text of your push straightforward. 6. Make your customers feel loved and appreciated: Holidays are a great opportunity to thank your customers. Send them a notification telling them how your brand appreciates their loyalty and wish them Happy Holidays. Make them feel your appreciation in order to increase their trust. 7. Send an abandoned cart campaign: People can be easily distracted during a purchase, especially during the holidays. Make sure to send them a reminder to complete the purchase or they might complete it elsewhere. Post-Holiday While you may rightly be focused on the holiday season itself, the most successful mobile marketers are also thinking about January too. 1. Plan to retain your customers: As people return to their normal schedules, app usage will fall. Consider kicking off special promotions or sending well-planned push notifications throughout January to promote your app and re-engage customers. Don’t wait until January to create this plan, it should be created in the pre-holiday planning phase and now is the time to execute it. 2. Incorporate your brand value into the ‘New Year’ theme. How can your brand help the customer achieve their New Year’s resolutions? 3. Make room for new products: Post-holiday is a good time to push the stock left from the holidays. After the holiday season officially ends, you can send customers a last chance opportunity to purchase leftover items in their carts or on their wish lists that they just never got around to purchasing during the holidays. 4. Nurture your customers: Taking on a campaign means nurturing your customers through the whole process and completing it correctly. Plan your push notifications accordingly and keep in mind what your customers are focused on, now that the holiday is coming to a close. What do they want and need from you? Conclusion Today, mobile is key and push notifications are the force to actually open the door. Used correctly, push notifications will differentiate your brand. Make sure your marketing strategy is solid, tested and prepared for the holiday turmoil. People lead busy lives and sometimes they need a push in the right direction. As a marketer you can assist them by sending out individualized and relevant messages at the optimal time. Highly effective targeted campaigns via various digital channels will help you keep ahead of the competition. By adopting these techniques you can make this holiday season even more successful than last year, all while keeping your customers happy and engaged. 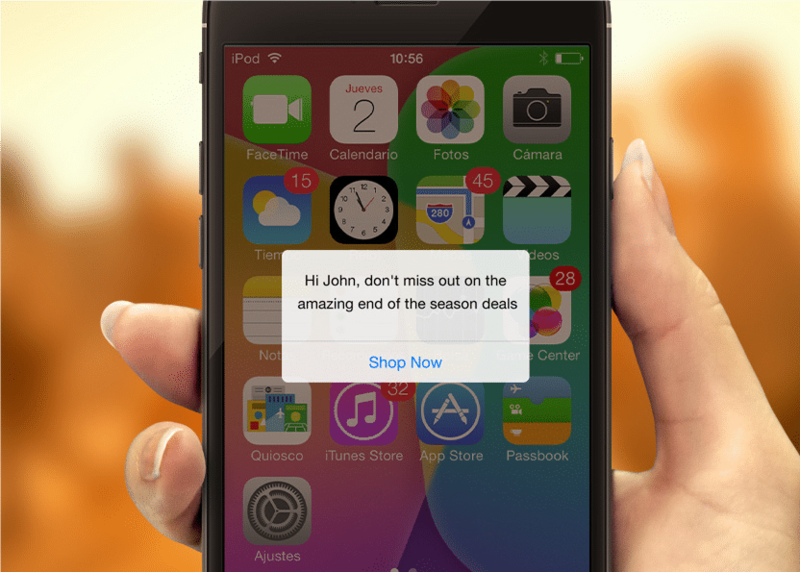 We can help you integrate a successful push notification campaign into your holidays’ marketing strategy.